Bellevue College was lucky to host none other than Mike Belzer, one of the lead animators for the popular 1993 film “The Nightmare Before Christmas.” This event took place on Nov. 13, 2018 at noon. For the event, BC offered one of its multi-tiered lecture halls with three projector screens for Mr. Belzer to show pictures and videos on. The college also provided a spread of cookies, sandwiches, coffee, tea and ice water. In attendance were several BC students who expressed interest in careers in animation and at the end of the presentation many jumped at the opportunity to question the industry veteran. Belzer’s presentation was informative, captivating and full of some great jokes. He started with a brief history of animation and illustrated how stop animation was the hot new technology of the early nineties. Belzer described how “The Nightmare Before Christmas’” production was riding that wave and had access to the industry’s newest tools such as motion-controlled camera arms. The most captivating part of the presentation were the pictures and videos Belzer had from the nearly three years the production crew took to make the film in a 40,000 square-foot warehouse. The pictures of Tim Burton and the team of creators were incredible. Burton looked like he was about 15 when he wrote the poem which would later become the beloved film, while actually being 24. Most of the characters were made by baking an epoxy around armatures which had various parts to adjust depending on the character. 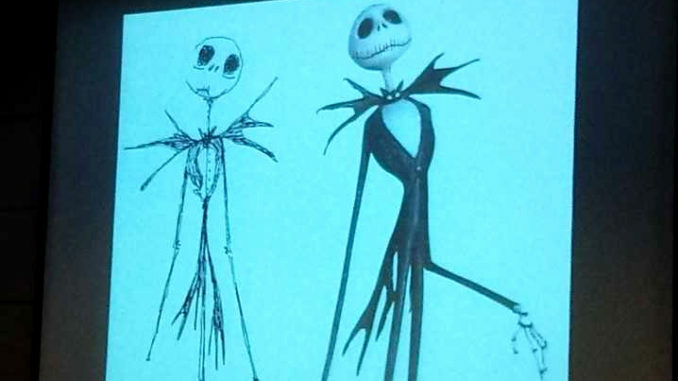 Oogie Boogie’s armature was the most advanced one ever built at the time of production. The film has full size sets and one-quarter scale sets so that they could show different perspectives without having to build massive sets. Some unexpected details about the production were also shared, such as how production began well before a script was finished by Burton, or the fact that Burton did not spend very much time on the set. Another interesting fact is that the old film cameras used were hard to come by, and after discovering that some of their cameras had been used to film atomic bomb testing, they even had a crew come in with a Geiger counter to make sure that the cameras were not radioactive. Belzer informed us that every second of the film is composed of 24 frames, so that’s 24 minor adjustments made to the character each second, totaling roughly 110,000 frames in the entire film. Using the technology of the early nineties, production would finish a scene, send it off to get finalized, and gather up as a cast to view the completed scene. It was high pressure work, because one frame that is off meant the whole scene had to be reshot. Belzer played a video taken at one of these morning meetings as the crew discovered a misshot frame, and just by watching the video you could feel the disappointment of the crew as they groaned when the screen made an odd flash.